Want to talk to a recruiter? Fill out the QUICK FORM below to get started. If you’re looking for a trucking job and hold a CDL-A, we have an opportunity for you. We are currently hiring truck drivers for our solo, team, flatbed and temperature controlled fleets. Choosing a carrier that offers career security and job satisfaction doesn’t have to be complicated. Enjoy both now with an industry leader – Celadon. 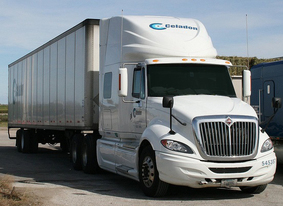 Celadon Trucking Services, one of North America’s strongest truckload carriers, has been offering outstanding driving careers since 1985. You can count on consistent, quality freight with Celadon because our customer base represents the top of the world’s leading manufacturers and retailers. Our drivers benefit from our reputation with more opportunities, higher miles and competitive pay. * Plus, Celadon’s $0 down, lease-less truck purchase program is one of the best truck purchase programs in the industry. We guarantee dock detention pay, safety and performance bonuses, and have an excellent employee health program. These are just a few of the ways Celadon shows you the respect you deserve. Take a look at all the career possibilities at Celadon – then get in touch. We’d love to talk to you! Recruiters are available 7 days/week.